Using HTML and CSS to make your poetry book look its best. Take it easy on your team, but make it easier for your readers. 1. That software projects should start small and scale up. The Poem? How Many Divisions Does it Have? As I put the finishing touches on Yellow Buick Review No. 2, I take a minute to reflect on what has changed, for good and ill. This tutorial is based on the first generation of HTML/CSS techniques we figured out (with plenty of help) for our poetry E-books and E-book anthologies. The first issue of Yellow Buick Review used those techniques. The commercial offerings at Bicycle Comics all use the first generation markup/code. It works, it looks good, it’s even elegant in the right light. We have a second-generation set of techniques, though. Those are what I’ve been using on Yellow Buick Review No. 2. The biggest difference? YBR 2 uses the div element to structure each stanza of a poem. The big difference? In 2nd Gen, each stanza gets wrapped in its own <div> tags. It is the <div>, not the <p>, that holds the margin-top attribute and value. 2nd Gen also uses percentages for most of its measurements, not em. After Step 3 Comes…Step 3? Why does Step 3 get four blog posts? Because the “Look and Feel” of your E-book matters. 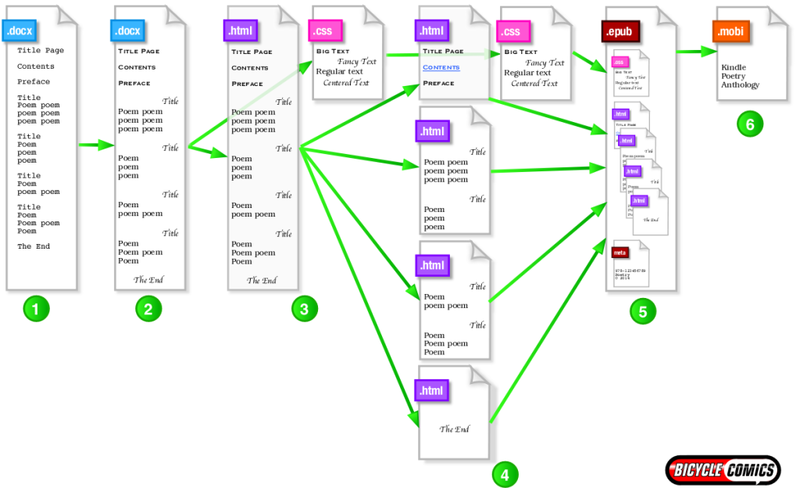 The Bicycle Comics workflow has six steps, but maybe “phases” would be a better word. It’s tough for me to know the right level of detail: too little information and this blog won’t help people format their poetry E-books, too much information and I’ll scare away beginners. Once you get the hang of it, you’ll have no trouble simplifying your HTML and your CSS, streamlining your CSS, and making your internal CSS external. Those three tasks rightfully belong in Step 3, but I understand how advanced HTML/CSS coders might want to pick up the pace. The primary points of this blog are to document the Bicycle Comics workflow for our future projects, and to provide a gathering point on the Web for best practices and conversations around electronic production (eprdctn) of poetry E-books. I’d love any and all feedback on pacing. Tomorrow, we’ll move for real into Step 4, and I’ll talk about splitting the HTML file into sections. Meanwhile, though, I’ve made an expanded illustration of Step 3, with appropriate attention given to the tasks we’ve walked through so far. What do you think? How has the pacing been on each step? Let me know in the comments or on Twitter at @ybreview. Everything we’ve done so far has used an internal cascading style sheet (CSS). Now we’ll move it outside our .html files. There are dozens, maybe hundreds, of tutorials that do a fine job explaining how you can move an internal cascading style sheet to an external .css file. I’ll give you just the basics, and then I’ll spend a little more time on the why, as pertains to E-book production. Remove the complete CSS info from our .html file with the “cut” command. “Paste” that CSS info into a separate, new document, which we’ll save as a .css file. Tell our .html file where the .css file is, so that our HTML can find our CSS whenever it needs it. Let’s order lunch and streamline our code classes. Dump the needless CSS you’ve inherited from prose-oriented programs, and replace it with CSS that understands poetry’s unique needs. Pardon the mess; MS Word was visiting. It’s inside our .html file, which is not as useful/easy as giving it its own document. It’s terrible, terrible code anyway.